How Can I Convert A PDF And Other Ebooks To The ePub Format? I've got a lot of ebooks in PDF and other formats, but some ereaders - like, oh, this iPad I just bought - only support specific formats with their default reader apps. What's the best way to convert those PDFs to ePub? The fact is, ebooks are still going through a lot of growing pains, which often leaves ebook early adopters like you in the lurch. As the always excellent Matt Buchanan over at Gizmodo explained, the ebook industry is in a place much like the music industry was in the late '90s: Everyone's looking for a standard format they can all agree on, DRM is getting in the way, and - for the moment, at least - it looks like ePub is as close to the MP3 of ebooks as it comes. 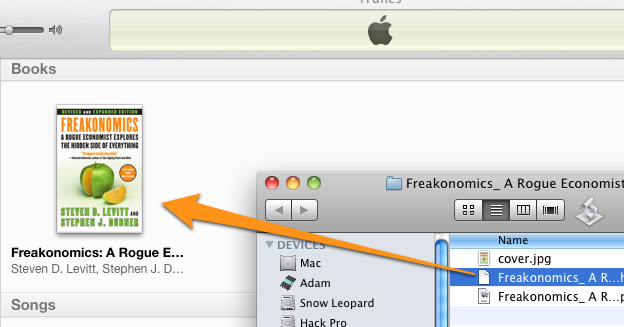 Unfortunately, ePub is the only ebook format iTunes accepts (again, for now). On the plus side, ePub is a free and open standard, which is a very good thing - though DRM can still muck up ePub, so it's not all roses and puppy dogs. Download and install Calibre, the free and cross-platform ebook management tool we've featured a couple times before. The first time you start Calibre, select Default as your device type. (See screenshot below.) You could get more specific, but I found going with default worked fine for me, and I wanted to keep this as device agnostic as possible. 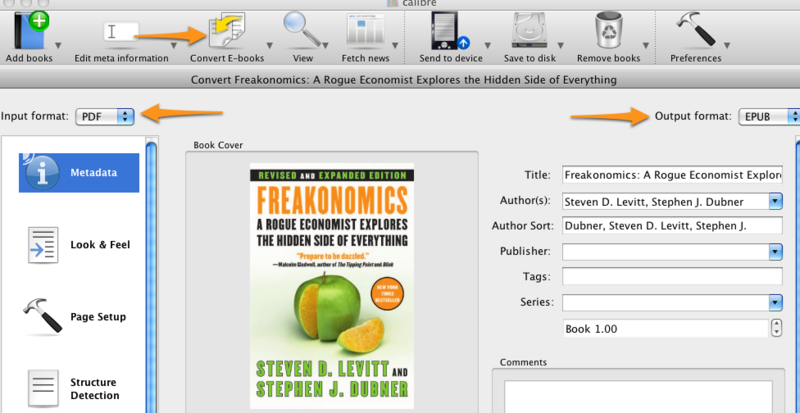 Drag and drop the ebook you want to convert to ePub into Calibre, edit any metadata if it's not already to your liking (right-click the book in Calibre and select Edit meta information -> Edit metadata individually), then click the Convert E-books button in the toolbar. Verify that you've got the correct Input/Output formats: On the far left of the Convert window, you'll see the Input format. On the far right, you'll see the Output format. The input format should default to the format the ebook is already in, and the output format should default to EPUB. If it's not, just choose EPUB from the drop-down. Convert! When everything looks how you like it (you can change the book cover if you're not happy with how it looks here), click OK and let the conversion roll. Move Your New ePub Book to Your Device: Once the conversion's complete, right-click your newly converted book and select Open containing folder to find your new ePub-formatted ebook. You can stop here if all you wanted was to convert the ebook to ePub. If you're an iTunes/iPad user and you want to get that ePub book on your device, simply drag and drop the converted ePub book into iTunes. If you're using an iPad, plug it in, make sure you've got iBooks installed, and just drag the book from iTunes to your iPad in the iTunes sidebar under Devices. Enjoy! And that's it. Next time you launch iBooks, you should see your newly converted ePub ebook, ready to read. It's clearly not a perfect method, but huge thanks go to the developers behind Calibre for making it a relatively painless process — especially at a time when ebook standards are still this unformed. P.S. Got a preferred method of your own for converting ebooks from one format to another, let's hear about it in the comments. I just bought a Kobo reader - E-book Pdf files on my computer go automaticly on the documents section on the kobo when they go there you cannot change font sizes. I found out that they have to be Epub so when you copy from computer to e-reader they will automaticly go to the book list so you can read them and you will be able to enhance the fonts. Question how do I convert the pdf to epub to go on the Kobo reader? Don't put all your hopes on Calibre- as good as it is, it simply jumbles tables and font formatting when you convert from PDF to epub. Also mentioned is Sigil for fine tuning. Really?! Fine tune a 400+ page pdf book by hand, page by page?! hi, i have an archos7, i want to upload some ebooks to it but it does not support and read pdf formats. what other applications can i use to put in my archos7 to read my pdf files? My favorite way is a roundabout way for PDF files. I first save it as a Microsoft Word DOCX file using Adobe Acrobat. And then I use EPUBgen from Google which converts DOCX to EPUB. The EPUB file looks spectacular with correct formatting and graphics. Then I can tweak the EPUB metadata with Calibre so that I can sort by author, title, etc. on my Kobo Wifi eReader. Just an awesome tiny little ereader. Para 3 "Drag and drop the ebook you want to convert to ePub into Calibre"
Have you tried to convert the ebooks that are designed to be used with KOBO? They merely have a complex alphanumeric name with no extension. 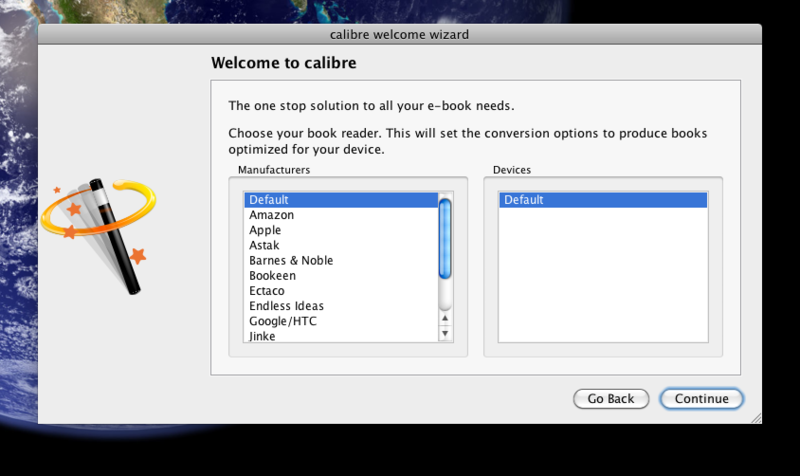 SO as far as converting KOBO books is concerned Calibre is as much use as Obummer - none at all. I just bought a kobo touch and wish to read books in my regional language. I have many of them as pdf files. Pdf, being too hard to zoom in and read, i downloaded a pdf to epub converter and converted the file to epub. But On kobo, it appears in random english letters which makes no sense. I also inststalled malayalam (my languge) font on kobo. still .... Help pls. Hello! Free online converter tools are also useful, if you are on a tight budget. So, if you are searching for options to Calibre, here's an useful suggestion: kitpdf.com that can convert the pdf document to epub file.